Isuzu Motors is a Japanese commercial vehicle and heavy truck manufacturer and one of the world's largest producers of medium to heavy duty trucks. Best known in Europe for its production of diesel engines and a wide variety of trucks, Isuzu is also a shareholder in Anadolu Isuzu which is primarily involved in producing and marketing commercial vehicles, including light trucks, pick-ups and buses. Since its establishment, the company has focused on customer satisfaction, maximum quality in production, and after-sales services. Isuzu busses provide the ideal solutions for medium haul transportation. 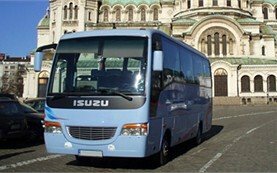 Its Turkuaz minibus offers an ideal car hire solution for transportation on short and medium-haul routes, city transportation, and panoramic tours and excursions in Bulgaria.